Based on a combination of Roman centurion’s grave stelae and extent Greek and Italic finds. 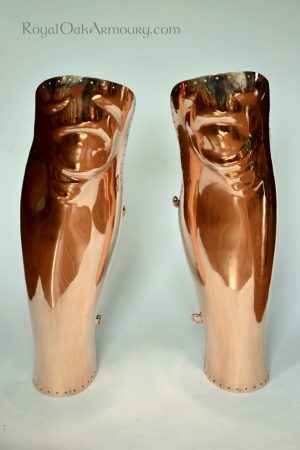 Our greaves are skilfully fashioned from bronze to accurately match the contours of the individual wearer’s leg – which we ensure by taking or requesting simple plaster bandage casts. After forming, the surface of the bronze is painstakingly smoothed with tens of thousands of hammer blows, then exhaustively sanded to provide a glass-smooth, highly-reflective surface. Edges are pierced with small holes for the attachment of a linen and goatskin liner, which we can provide at additional charge. 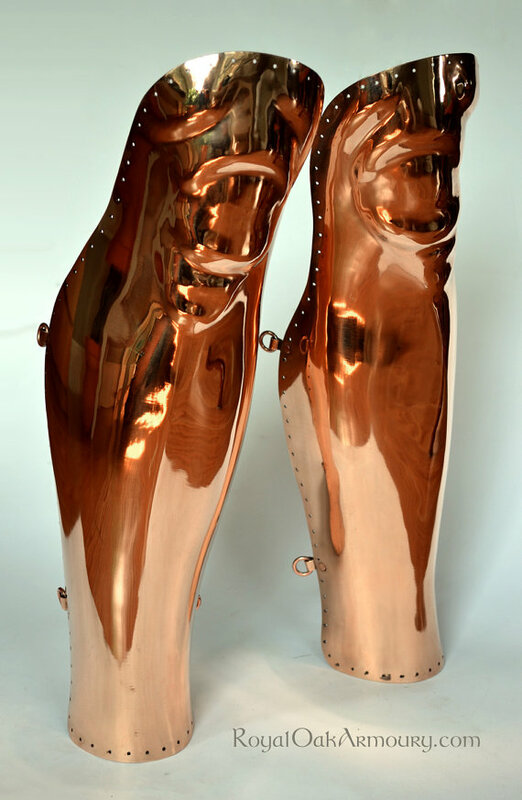 Bronze loop and ring assemblies along the back of the greaves facilitate attachment with a leather cord.